Grand Prize Winner of the NASA/Etsy contest was the Northstar Table by Colleen and Eric Whiteley of Brooklyn, NY. 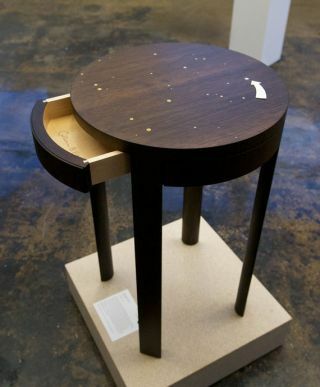 The table features a hidden compartment that can be opened by pressing one of the stars on its surface. The Northstar Table won Best of Show, nabbing a $500 first prize and trip to see the space shuttle Endeavour's last launch in April 2011 for the Whiteleys. This story was updated at 1:52 p.m. ET. Talk about crafty: The votes have all been counted in a NASA-sponsored contest to choose the best space-themed craft, and the winner is … a starry table with a secret. The table doesn't take to the skies, and it won't be bearing any place settings or centerpieces on Mars, but it did win first place in a space crafting contest held by NASA and the online arts-and-crafts marketplace Etsy. NASA and Etsy launched their contest to choose the best "space crafts" — handmade works inspired by the space agency and its programs. Enthusiastic artists submitted a total of more than 600 entries in three different categories: two-dimensional original art, 3-D original art and 2-D reproduction. NASA astronaut Steve Robinson (right) and Etsy craft site admin Laura pose for a photo during Space Craft judging day on March 18, 2011. NASA and the online craft website Etsy hosted a craft contest for the best space-themed craft, with cash prizes and a trip to a shuttle launch for the winners. The grand prize winner was announced at a ceremony in New York City on Friday (March 18) at the Etsy Labs community space in Brooklyn. Judges included NASA astronaut Steve Robinson, Etsy representatives, science journalists and local science-education officials. In addition to the $500 first prize, the Whiteleys will also receive an all-expenses-paid trip, along with a guest, to attend the next space shuttle launch at NASA's Kennedy Space Center in Florida, officials said. The shuttle Endeavour is slated to blast off April 19 on its final flight, ahead of the shuttle program's retirement later this year. The winner in the 2-D original category was an embroidery piece called "High Texture Hand Embroidery of the Moon" by Rachel Barry Hobson. The piece "Universal Thoughts," which depicts what look like water droplets floating in interstellar space, won in 2-D reproduction. It was created by artist Nikkita Karsan Bhakta. In the 3-D original category, artist Patrick Burt of Arizona won with "Brother Sun, Sister Moon." This piece — a titanium ring embedded with bits of silver, gold and diamond — represents the stars, sun, moon, Mercury, Venus, Mars, Jupiter and Saturn, NASA officials said. Each of these winners receives a $250 Etsy shopping spree and a swag bag full of NASA and Etsy merchandise, NASA officials said. In helping stage the contest, NASA hoped to engage a large audiencethat may not follow space exploration closely. The online Etsy community has 5.8 million members, and 96 percent of them are women, NASA officials have said. The Space Craft contest entrants spanned a wide range of media, styles and degrees of whimsy. One finalist in the 3-D category, for example, was a floppy fleece space shuttle hat, complete with a smiling Hubble Space Telescope attached via a grapple arm. Despite any sentimental advantage the hat may have enjoyed due to the shuttle program's looming retirement, it didn't take home any hardware.